How does Campbell Cane work? What is Campbell Posture Cane? Traditional canes may cause crippling pain due to the awkward position of the handle which make you walk hunched over, head down causing neck and back pain. The solution is the upright Campbell Posture Cane – the unique walking cane that allows you to walk more upright with your head facing forward instead of down. The makers of the Campbell Posture Cane claim that with their cane you are more secure, comfortable, balanced and safe using this cane. 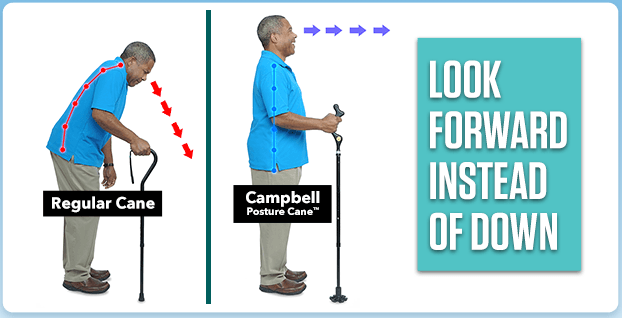 According to the Infomercial the secret of the Campbell Posture Cane is the unique Campbell Handle which takes the pressure off your shoulder and wrist and placing you in a natural upright pain-free position. The Campbell Posture Cane comes with a 360 degree traction tip that makes the cane stand securely right next to you, this helps in getting up and out of chair. It also helps in safely navigating sidewalks and stairs. The Campbell Posture Cane comes with 12 height adjustment settings which makes it suitable for most people with varying height. Also the manufacturer claims it to be lightweight yet sturdy. We will methodically analyze all the promises made by the Campbell Cane manufacturer and show you the how they are false. “You will be MORE perfectly balanced, safe, secure, and more comfortable when you walk” – its a sales-pitch, Campbell Cane has no such feature that makes it superior to a regular cane. “Helps you easily get up and out of chair” – We agree with this claim. It would be much easier to get up using a Campbell cane than a regular one. 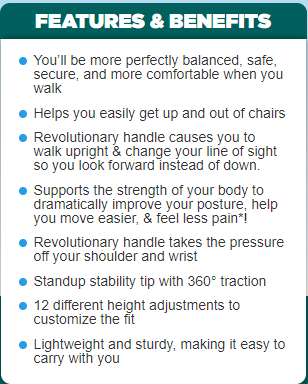 “Revolutionary handle causes you to walk upright and change your posture, help you move easier and feel less pain*” – This is the most gibberish of all the claims. There is nothing “REVOLUTIONARY” about the Campbell Cane handle. It does not make you walk upright on its own, you have to take efforts to change your posture. It is the height of the cane and the angle of your elbow that decided where you look. “Supports the strength of your body to dramatically improve your posture, help you move easier and feel less pain*” – notice the asterisk(*) mark after the word pain – hey have give the disclaimer at the bottom that says – “Not intended to permanently fix posture or chronic pain. Please see your doctor if you have recurring posture problems or pain when standing straight.” Do not believe in any such claims that promises pain-relief, in fact the handle of the Campbell cane causes more wrist pain. “Revolutionary handles take pressure off your shoulder and wrist” – Again more nonsensical claims without enough evidence supporting the claims. “Stand-up stability with 360 degree traction” – A lot of jargon used for a simple non-skin feature. “12 different height adjustments to customize the fit” – That’s a good feature. “Lightweight and sturdy making it easy to carry with you” – Again some unprofessional claims, if they say Campbell Cane is lightweight they need to support it with facts, like it’s weight. If they say Campbell Cane is sturdy then they should produce the proof of it’s sturdiness by mentioning about its material. The official website of Campbell Cane tries to lure in the elder buyers by stating “Look Forward with Campbell Posture Cane”. This claim is utterly false. You just cannot hold a walking cane and look straight. When you walk you naturally tend to look down and you should. Also there is a flaw in the way the person in the photo holds the Campbell Cane. The angle at which the elbow bends when he holds the cane is 90 Degree which is not recommended. MayoClinic.org recommends that the elbow angle should not exceed 15 degree. This photo is just so ridiculous, they have purposely used a shorter regular cane to make the user slump forward. There are regular canes whose height can be adjusted just like the Campbell Cane. Campbell Posture Cane offers no added benefit that the regular cane does not. In-fact the Campbell cane makes walking uncomfortable. Campbell Cane claims it can be used “safely navigate hills, uneven terrain, sidewalks and stairs”. With such claims Campbell Posture Cane promoters are trying to convince the old folks that Campbell Cane can make them do all those activities that they had stopped, this is hogwash. Not just Campbell but none of walking canes can be used for walking over uneven terrain, especially for elder folks. It makes a good “hiking cane” though and could be suitable for hilly areas for younger people. The Campbell Posture Cane is stuck in identity crisis. It neither has a good support, nor is it suited for people with balance issues. The manufacturers of the Campbell Cane are trying to promote their cane as a miracle product that claims to make you walk straight again. Well this is not gong to happen. As per the reviews that we have studied and analyzed its not what they portray it to be. Our verdict on the Campbell Posture Cane is that it is just a regular walking cane and the change in the handle design would not in any way have any benefits more than the regular cane. When selecting a Cane the most important factors are the Grip of the Cane, the tip of the cane and the height of the Cane. The Campbell Cane fails in the first two parameters (grip and tip). The unusual grip handle of the Campbell Posture Cane is the most stupid idea, if that was a better grip design than someone would have definitely come up with this design earlier. The grip of the Campbell Cane is more suited for people who don’t have any serious balance issues. As mentioned at the top the Campbell Cane is trapped in an identity crisis. They have tried to load all the features in this cane and it is good at none of them. Does the Campbell Cane skid? Given the small tip of the Campbell Cane it is likely to skid. What is the height of the Campbell Cane? The official Campbell Posture Cane website does not mention the height of the cane. The Campbell Posture Cane is expensive priced at $40. There are tried and tested canes out there that cost not more than $15 and we don’t see any reason why you should buy this expensive cane. That is another disadvantage of the Campbell Cane, it does not come with any warranty. Should I buy the Campbell Cane? Nope. This is an expensive cane that does not deliver what it claims. Don’t believe all the false promises made by the cane. It is not at all pain-free, the awkward grip handle has more chances of causing you pain. 3 Comments on "Campbell Posture Cane REVIEW"
Why isn’t the height of the came mentioned, as well as the adjustments in inches. Is it because there is a problem with weight bearing on a fully extended cane? We may be the first product to receive testimonials from Medical doctors, osteopathic doctors, chiropractors, and physical therapists. It would be great to add your opinion, as a former cane manufacturer, and how you feel this device functions as both an assistive device, and a self defense weapon. Maybe the Red Hats Society could use them. Your expertise would help, and be most appreciated. Here is what the doctors have to say. The Posture Cane is unlike any other cane on the market because it directly address the compensations placed on the spine by traditional canes for centuries. The Posture Cane was engineered with the spine in mind. The Posture Cane allows the person to walk without their neck in the forward position. When the cervical spine moves forward it creates what is called Upper Cross Syndrome, this can lead to a myriad of other secondary conditions, such as neck, shoulder, and low back muscular imbalances, decreased range of motion in the neck, decreased oxygen intake by up to 30%, it also places abnormal loads of stress on the disc in the spine; causing increased and early onset arthritis. When the head is pushed forward (anterior) while using traditional canes, the person will also take shorter, shuffling steps, the gait mimics someone who has Parkinson’s disease. The Posture Cane directly addresses this problem head on. With the Posture Cane, the overall posture of the walker is constantly within the normal range. The ears stay over the shoulders, the shoulders stay over the hips, the hips stay over the knees, and the knees stay over the feet. This translates to less neck and shoulder muscular imbalances, increased active range of motion in the neck, increased oxygen intake, etc. The Campbell cane has a unique handle that eliminates undue forces from being translated through the wrist, elbow and shoulder. I feel the Campbell cane is an assistive device innovation that is past due and will like change the face of the traditional straight cane. Its multiple functionality lends itself to being able to be used by patients for a multitude of conditions as an assistive device. As a manufacturer of custom canes for self-defense and an instructor in cane and stick fighting, I have handled numerous canes in various styles. The Campbell Cane however is very unique in form and as an owner of one, I have found it to be quite functional not only as an aid in mobility but also as a great tool for self-defense. In the case of mobility, I can walk longer and further without the fatigue in both my hand and shoulder and the rocker style boot allows a positive and constant grip on the ground. Unfortunately, prior to the Campbell Cane, all of the canes that were available were designed to carry the weight that a weakened or aging body could no longer support. For a support cane to be effective it needs to be of a height that would allow it to be used as an extension of one’s arm to take the weight off the affected joint and shift the weight to the stronger arm. For a patient with a balance problem the Campbell Cane offers a completely different kind of support. The design allows the user to hold it with their elbow bent rather than extended as is needed with a supporting cane. This cane works more like a hiker’s tall staff that can be used to create a three point stance. For a healthy individual who can stand and walk on two feet with ease, the third point of their stance is usually a visual point ahead of them. With that focal point, the brain can create the triangulation to add stability to their stance. For a patient with balance issues and this can be part of the aging process or due to trauma, a standard cane does not offer a very stable third point to balance against. The Campbell Cane is used in a position where the cane is placed ahead of the walking person offering the same type of triangulated balance point that others find in that visual focus. Your cane does offer a lot of functionality and helps people to stand up straighter and thus increase their stability. As soon as I held your cane I could feel the difference and see the genius behind it. I left it out and have already had questions from patients. The Campbell Cane was very much responsible for improving my posture and lung function during the rehabilitation period, and enabling me to return to full-time work. To see me now, at age 70-½, walking upright, at speed, and with my feet in correct straight position (prior to surgery, I had been extremely crow-footed all of my life) has impressed the heck out of my orthopaedic surgeon and my family doctor, who don’t see such a full recovery to better-than-normal in many patients in my age range, and none who have also had fibromyalgia for nearly 40 years. I can’t say enough good about the cane (and its rocker tip). I hope never to be required to use it again (smile), but am hanging onto it in case my luck turns bad! Jacquelyn Thayer Scott, OC, PhD, LL.D, Dipl. Mike Piedmonte is a retired New York Police Officer, who wants me to speak at a monthly meeting of about 750 retired police officers in this area. Many have balance issues, and he feels that I can help them. A quick note to thank you for allowing my husband, Mike, to “test drive” your wonderful walking cane. It has made a world of difference to him, enabling him to walk with confidence, improved posture, better balance and stability. I look forward to seeing this truly life changing product being marketed in the near future to assist the thousands of people who would benefit from it’s use. I wish you much success! Again, thank you for improving Mike’s quality of life with your remarkable product! Most of my patients need a cane for support and the last one I saw who needed it for balance was hospitalized the next day. I will be using them and will include them in my personal injury classes. The Campbell cane has several design features to support balance with less interference of the normal gait pattern and less force displaced onto the upper extremity joints. The handle allows a more natural grip without requiring the wrist to be the weight-bearing joint of the body. The increased length of the cane allows a person to stand more upright throughout the gait cycle and maintains a more natural position in the sagittal and coronal planes. This also limits the shift of weight onto the strong side of the body and minimizes force that needs to be applied to the cane. By allowing the elbow to be flexed during gait, the muscles, ligaments and joints in the upper extremity share the work of supporting the body during gait which minimizes wear and tear on the joints. This supports a more natural position during assisted gait and also allows a more normal swing of the upper extremities that will load and unload the coil spring mechanism described above. This is an essential part of supporting gait as it adds to the efficiency of movement and decreases the work required for walking. The goal of assisted gait is to approximate most closely the biomechanics that occur during normal gait. Traditional assistive devices have not focused on the biomechanics of gait in the same way that the Campbell cane has done. Providing support while maintaining balance, efficiency and the most natural gait possible should be the goal of all assistive devices.